The Brother that followed me home. So how does an unusual and practically rare typewriter hide itself in plain sight in a typewriter shop? By being a Brother 760TR. John Lavery informs me that the TR designation next to the 760 means “Tabulator and Repeater”. The repeater is the repeat spacer button that you can see down on the bottom right hand side of the typewriter. A magnificent creation that works exceptionally well on this machine. 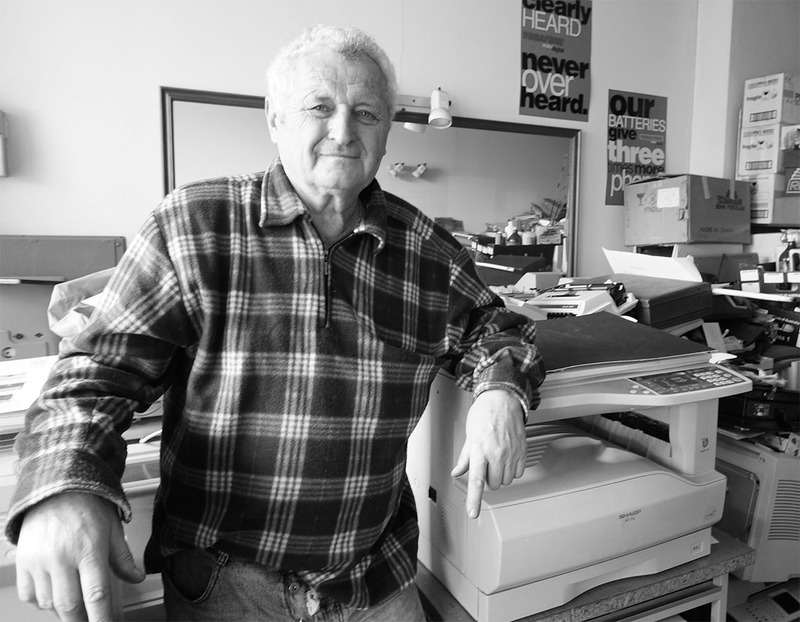 As you would expect from Tom’s shop, the machine is in brilliant working condition and it feels and writes like it is brand new. In fact it even looks new, bar the slightly worn feet. The cover that came with it doesn’t match the machine’s colour and the cover’s lock was a bit stuffed, but honestly I didn’t care too much about the cover as I can rip one of them off the several other million of these machines that I have seen floating about on eBay that often go cheap. 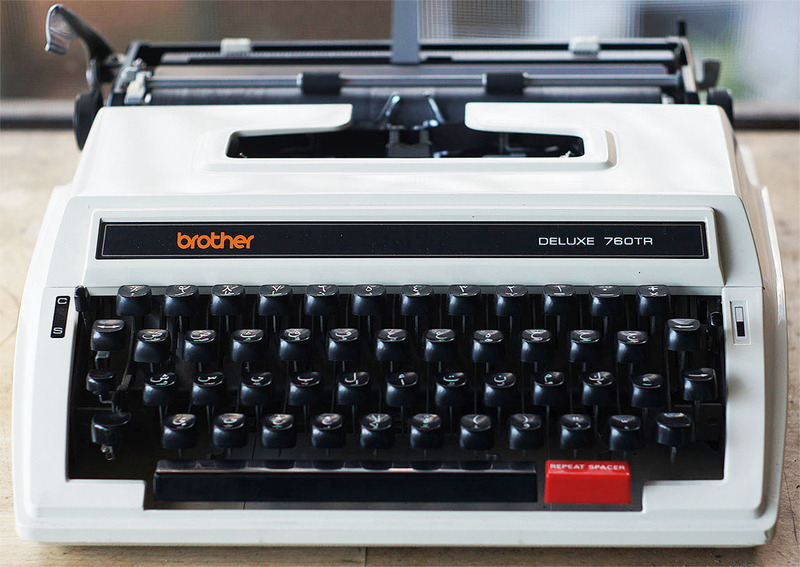 I just wanted this typewriter. Confused? Are you asking yourself.. “Why would Scott want a plastic Japanese mass produced machine, that is far from rare, when he has so many other good Typewriters? I mean, even he admits there were millions of this machine produced”. If you just asked yourself that question or something like it, you just did exactly what I did when I glanced at this typewriter sitting a bit neglected on top of a pile of other bits and pieces in Tom’s shop. See it there, right next to Tom’s elbow to the right? And no offence, if you haven’t spotted it yet, you’re not paying attention. Go back and have a look at the picture that is second down above. I mean…. have a really close look. See how there’s only two colours on the ribbon selector? That’s usually a give-away on this size machine that this is a script typewriter of some kind. …… hang on a second. That’s script alright. I’ve been after one of these for a little while. Have you tried doing a search on eBay for one? Nothing. Which is exactly the same thing that you get when you do a completed listings search as well. Richard Polt has had his hands on a couple, and Adowa also stumbled across one. But other than that these typewriters (at least in western countries) are exceedingly thin on the ground and the internet. Actually, it goes further than that. While I haven’t exactly explored Indonesia, friends of mine in Islamic countries have looked about, and have found that these are very hard to get their hands on and are quite sought after. Particularly in areas where there’s intermittent power access, where they are invaluable. There’s been some discussion about future employment possibilities in this household, and a little while ago I thought it might be a good idea to learn some Arabic – if anything to keep on contact with my friends overseas. Florian gave me an idea a little while back with his own blog, which he originally established to help him get a stronger grasp on the English language. And it occurred to me that I could very well do the same through a typewriter of my own. I can’t read Arabic, but I have quite a history with it – enough to know that Arabic isn’t just one language. When I first worked at the Queen Victoria Market in Melbourne, I used to work with a stall-holder that was from Pakistan. He was an odd little chap who didn’t have a particularly elegant grasp of english, and was often finding himself in confrontation with customers due to what he believed was his lack of language skill. Actually, it turned out that it wasn’t his language. He was just a dirty old man who had a crap attitude to women. This was problematic for someone that ran a store that sold women’s clothing. At one stage he tried to teach me Arabic, but he was very impatient and the busy life of the market was not conducive to such things. So I never really learned. He eventually bought himself a little electronic Arabic to English dictionary – which is where I first saw an Arabic keyboard. As I have discussed before the QVM was full of immigrants from pretty much everywhere. I got along with the old Italians and Greeks, and when I when I eventually quit with the Pakistani (in a spectacular explosion of foul language and insults from both sides) the Russians – particularly the Russian Jews were very welcoming. However the Market was also home to a lot of refugees from Islamic countries that were at the time in conflict. Falling out with the Pakistani turned out to be fortuitous. In his own community he wasn’t very well liked, and so generally Muslims and Israelis alike were quite friendly to me after that, and so I generally got along with almost all of the traders in the Market because of it. A lot of the Muslims in the market were very religious, and as long as you respected that you got along with them well. The phrase ‘but by the grace of god’ was commonly used, and they were particularly poetic – if not romantic, in their phrasing when they spoke. The written language itself is incredibly beautiful. Compared to boxy Chinese or the stone chiseled runes of my own celtic ancestors, the fluidity of Arabic writing underlies the broad minds that were at work when the language was first developed. Take the Qur’an for example: While it came out of the same part of the world as the bible, many of the stories told within it depict vivid and colourful places that are compellingly imaginative and inspiring, which leaves the christian text’s tales looking decidedly dusty and dirty by comparison. The squarish dot on the right is 0, and 1 and 9 are obvious. That reversed 3 looking thing is actually a 4 – and is a depiction of 4 squiggled lines, while that O looking character in the middle there is actually near diamond shaped, and is a 5. I’d seen plenty of Arabic numerals before, as the Pakistani from the market used to write out prices for items he sold in his little notebook for the bookkeeping he did at home. All Arabic writing is from right to left, and as such the typewriter itself writes that way. While Teeritz and I were playing with the typewriter in Tom’s shop, Teeritz commented about how weird it seemed to have the carriage go the other direction. We had a bit of a laugh over the operation of the machine, as it seemed to feel so contrary to typewriters we were used to. It took Tom to point out that it was an Arabic Typewriter. Prior to that I just simply hadn’t have spotted it, and had dismissed it on a cursory glance for being just another Brother plastic. Now that I have it in my hands I am actually surprised by how good a quality machine this actually is, compared to other Machines of its era. However I didn’t immediately buy the machine. As it was a Brother, I instantly felt a bit weird about paying a fair bit more than the usual price that I see Brother machines sell for. But I thought about it for a bit, and went back the next day to buy the typewriter. After all, as I have pointed out these typewriters are very thin on the ground. I don’t have any affinity with Arabic particularly, and I’m certainly not a muslim. But I am interested in learning the language, so I just simply couldn’t leave this typewriter behind. Maybe I should write my own Florian-esque blog in addition to this one, while learning. I might end up with a new audience. That said, I think I am still going to try and find a more classical piece like Richard’s Olympia or Erika. 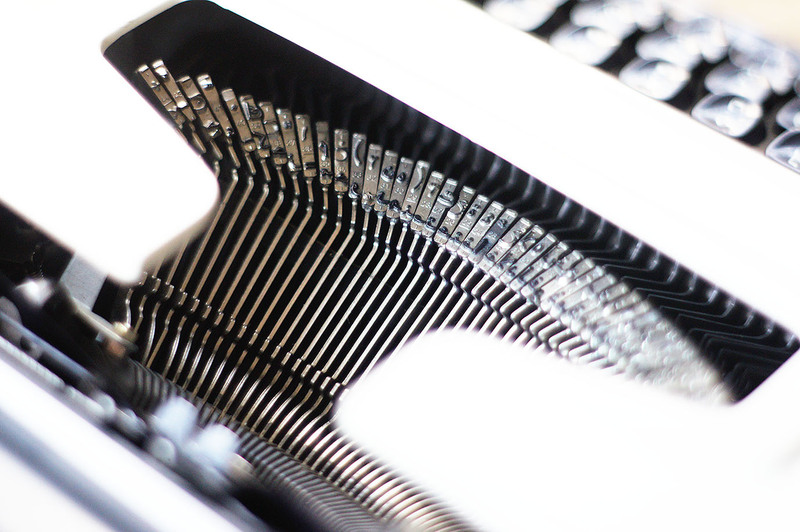 Those typewriters are as beautiful as the language that is being written on them. But that’s just me… I collect my machines for their beauty. September 14, 2013 in 760TR., Arabic, brother, Tom's shop, typewriter. ← A visit to Tom’s typewriter shop. Does it type proportionally, like my Arabic machines? I thought that typewriter was gonna tear a hole in the time/space continuum when I saw the carriage slide across the wrong way. At first I thought it was for the American market, you know, like the roads? And I still haven't figured out how to grip the carriage return lever. That's really cool! I hope you do learn to type on it so we can see a proper typecast. You know Richard, I don't really know! I have never stuck my hand in a Brother before, and I'm looking at what appears to be two linkages to the escapement for the letters, a linkage for the space, and another for the repeat spacer. But unlike your Olympia, I can't see how the characters may join up differently to the linkages to produce the proportional spacing despite there being 1 more linkage than usual. It is all a bit different than I am used to looking it, which could say yes – or could say no. It just isn't so clear cut. That said, I haven't observed any proportional spacing when I have been typing as yet. But I haven't actually tried just typing characters… instead I have been trying to type from another text while I learn the keyboard. So, at this point I'm going to say no – until I have had a good look over the machine. Ha ha ha ha. I know what you mean! Actually, the feel of typing with it is even stranger, especially when you find yourself pushing the carriage lever to activate it, rather than pulling it. Oh, I have no doubt that I will do so – if I actually get my head around the language! They catch a lot of flack for being plastic, but I'll tell you, those Brother machines are secret treasures, IMHO. They are quite good compared to other machines of their era, and cheap enough that you can source parts to replace covers and cases if you have to. Quite a nice find. The only Arabic machine I've seen in the wild was a big electric Olympia standard. There's no way I could justify that. It sure is a fine-looking typer! 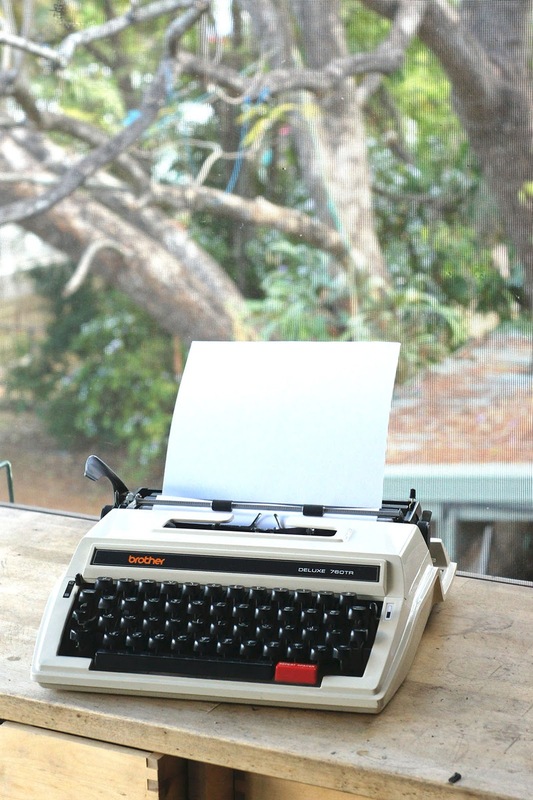 i am using this typewriter. Can u help me to service it. I dosent know about service cente. Hey, what kind of problems are you having? You know, it is. I am really surprised by this typewriter.